In ancient Greece lemons were used for culinary and non-culinary purposes. According to Greek mythology oranges and lemons were a symbol of richness and love. It was also believed that if you wanted to have sweet dreams you had to put some dried lemon leaves in your pillow just before you went to sleep. Lemons are a must in any Greek kitchen; they add the sour element to many dishes. 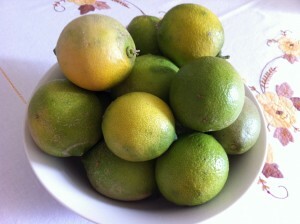 They are one of the main ingredients in ladolemono, which is used as a marinade and a dressing. The recipe is included below. Dioscorides applied lemon balm to scorpion or animal bites for its antibacterial properties. He also recommended adding lemon to wine to calm a person’s nerves and to counter depression. Preserved lemon peel was considered as one of the best digestives and ancient Greek doctors recommended it to weak and delicate persons. Lemons can help boost metabolism, assist digestion, and are great for the skin and prevent colds and flu because they are rich in vitamin C.
Ladolemono essentially means oil and lemon. It is one of the most popular marinades in Greece. It’s commonly drizzled over meat, seafood, poultry, vegetables and haloumi cheese. It’s a great marinade to add to your next barbecue. Simply pour or brush it over cooked seafood, meat or poultry. You can also pour over potatoes and bake them in the oven with lamb. It is also great over a leafy green salad. You can also alternate your herbs by substituting oregano for thyme or rosemary. I often add crushed garlic and fresh chilies for some heat. Place the olive oil, lemon juice, and oregano in a jar with a tight-fitting lid. Seal and shake until well blended. Pour or brush over barbecued meat, chicken or vegetables, or over a leafy green salad.